Al Lamb’s Dallas Honda -- The 2015 season’s third and final stop at Angel Stadium of Anaheim was another big night for Team Honda/HRC, as premier-class rookie Cole Seely rode to a runner-up finish, the best 450SX result of his career thus far. The unique elevated start proved no problem for the Californian, who launched off the line near the front of the pack, securing second place on lap two. Seely rode like a veteran, unfazed by race-long attacks from his pursuers. Among them was GEICO Honda’s Eli Tomac, who overcame a poor start and methodically worked his way through the field, making an exciting pass for third one lap before the checkered flag flew. Just one week after Trey Canard scored his first victory of the season, the Oklahoman rode to fifth place, making it three Honda CRF450Rs in the top five. The Team Honda/HRC rider would likely have finished even better were it not for a mishap at the halfway point. · The Wednesday before Anaheim 3, Team Honda/HRC hosted some special guests at their test track in Corona, California. Los Angeles Police Department Chief Charlie Beck, along with six other officers joined Cole Seely, Trey Canard and Eli Tomac for a unique day that will be the basis of a story in the May issue of Dirt Rider. · On the eve of the race, Malcolm Smith Motorsports hosted its fourth annual Supercross Fan Appreciation Autograph Signing, and over 900 fans pre-registered to meet their favorite riders. Team Honda/HRC’s Seely and Canard, along with GEICO Honda’s Tomac, Matt Bisceglia and Malcolm Stewart, were on hand for the excitement. · The Anaheim 3 pits were buzzing with the debut of Team Honda/HRC’s new photo booth, which allows fans to strike a pose on a replica of Canard’s CRF450R, with a backdrop featuring a pursuing Seely. Look for the booth near the Team Honda truck at other Supercross rounds this season. 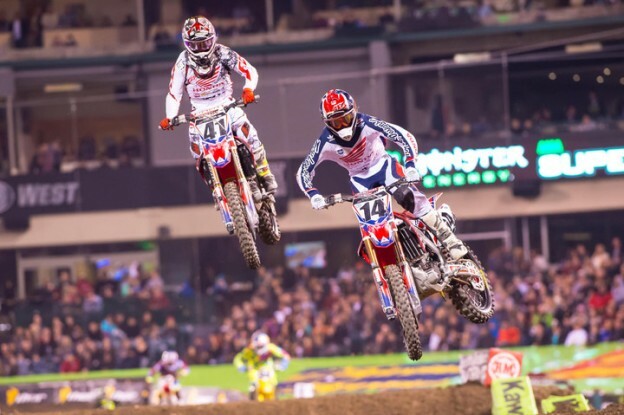 · The Anaheim 3 podium looked uncannily similar to that of last year’s Indianapolis round, where Seely was taking advantage of the break in the 250SX West series to serve as a fill-in rider for an injured Canard. As was the case then, Seely was joined in the top three by fellow Honda rider Tomac, only this time the two swapped positions, with Seely second and Tomac third. · The Honda Red Riders were on fire during the day program, each clicking off impressive times that landed them 2-3-4 overall heading into the night show. GEICO Honda’s Tomac was second-quickest at 57.210 seconds, Canard third with 57.487 and Seely fourth with 58.304. · With 84 points each, Canard and Tomac left Anaheim 3 tied for third in the championship chase. Seely still sits in seventh but has closed the gap on sixth to a mere four points. · Prior to the next AMA Supercross round, Team Honda will be attending Escondido Cycle Center’s San Diego Supercross Open House on Friday, February 6, starting at 6 pm. Under the watchful eye of the AMA officials, the mechanics brought their bikes to the Honda rig, pulled the heads and dropped the pistons to bottom dead center so that the measurements could be verified. Unsurprisingly, everything checked out fine on Seely’s and Tomac’s CRF450Rs.